The SL525C is a bipolar monolithic integrated circuit wideband amplifier, intended primarily for use in successive detection logarithmic I.F. strips, operating at centre frequencies between 10 MHz and 60 MHz. The devices provide amplification, limiting and rectification, are suitable for direct coupling and incorporate supply line decoupling. The mid-band voltage gain of the SL525C is typically 12 dB. Logarithmic IF strips with gains up to 108 dB and linearity better than 1 dB. The amplifiers are intended for use directly coupled. The seventh stage in an untuned cascade will be giving virtually full output on noise. Noise may be reduced by inserting a single tuned circuit in the chain. As there is a large mismatch between stages, a simple shunt or series circuit cannot be used. The choice of network is also controlled by the need to avoid distorting the logarithmic law; the network must give unity voltage transfer at resonance. The value of C must be chosen so that at resonance its admittance equals the total loss conductance across the tuned circuit. Resistor R may be introduced to improve the symmetry of filter response, providing other values are adjusted for unity gain at resonance. A simple capacitor may not be suitable for decoupling the output line if many stages and fast rises times are required. Values of positive supply line decoupling capacitor required for untuned cascades are given below. Smaller values can be used in high frequency tuned cascades. 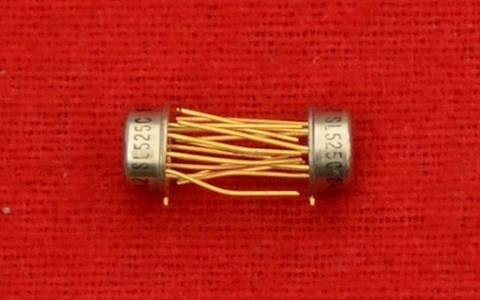 The 500 pF supply decoupling capacitor has a resistance of, typically, 10 ohms. It is a junction type having a low breakdown voltage, and consequently, the positive supply current will increase rapidly if the supply voltage exceeds 7.5V (see ABSOLUTE MAXIMUM RATINGS).